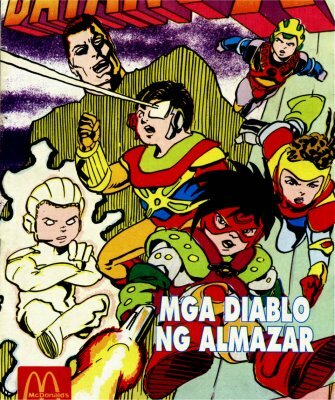 History: Batang X are a group of five children with superhuman potential kidnapped by Dr. Axis, an alien stranded on earth with her space ship. She needs their power in order to steal a material as a source of energy for her spaceship to leave the planet. A-Gel, who walks with crutches, gains the ability to fly, while his blind older brother Kid/Lat gains vision powers, including an eye blast. 3-Na can turn invisible, and G:Boy has superhuman strength. Comments: Created by Peque Gallaga. Originally appearing in a movie, the characters were sufficiently successful to spawn a short lived TV series. There was a comic book series published by Sonic Publishing, which expanded the story from the movie. Both the film and comic were sponsored by McDonalds. Thanks to Dan Ramon P. Geromo for providing all the information and images used on this page. This is his work, not mine. Thanks to Jubal Gallaga for additional information.